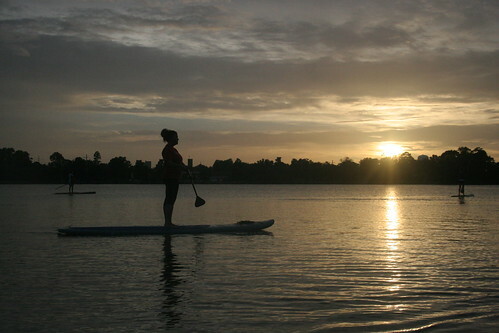 There was rain during the day, but the Sunset Paddle with BREC Outdoor Adventure could not have had much better weather. We even saw the sun for a while. 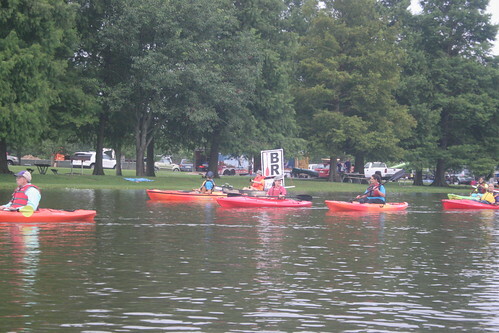 When got to the park early to get the PaddleBR sign canoe ready, the rain had just moved out of the area, but gradually the weather kept improving and people began arriving. By the time the BREC Outdoor Adventure crew with all their paddlecraft arrived, it looked like it was going to be the best weather we’ve had for a Sunset Paddle. 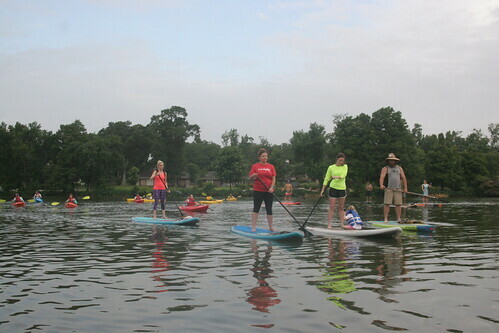 Last month’s Sunset Paddle had good weather but relatively low turnout. Perhaps it was a result of everything packing into May. 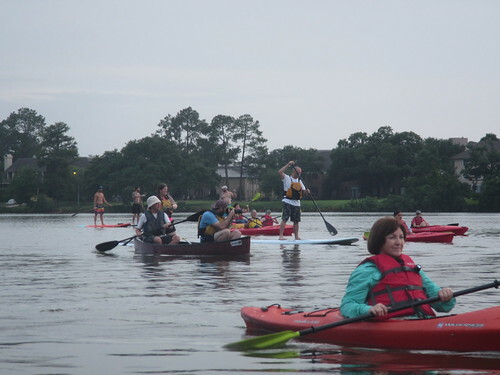 This time, even with rain all over the area during the day, there were over three dozen people on the water. BREC Outdoor Adventure, The Backpacker, and Muddy Water Paddle Company were all there with kayaks and paddleboards galore. 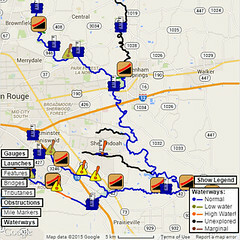 Mike brought his kayak and was looking forward to paddling it instead of the work canoe he’s usually in on Bayou Fountain. (We like both, but switching up occasionally is apparently fun.) Then as everyone was getting ready, the call went out for someone to paddle a photographer. Well, PaddleBR’s always willing to paddle news people around, so we grabbed another canoe from our set and Mike graciously filled in as photo boat driver. The trip around University Lake was excellent as always. 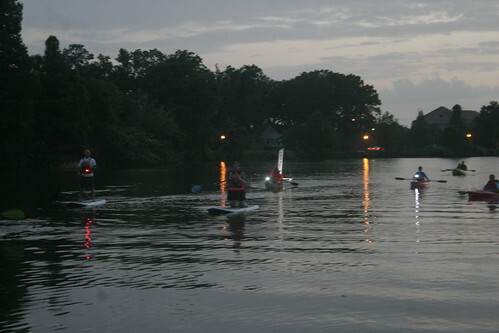 For once, there was not much wind (and even some points of veritable calm), which made paddling the sign canoe much easier than usual — after the Bayou Fountain expedition earlier in the day, an easy evening was just fine. The weather was so good, we almost saw the sun set. One of these Sunset Paddles, there will be a relatively cloudless sky framing the sun as it reaches the horizon, but sunset is still a great time to paddle even if you have to check your watch to know when it is. With the sunset behind us and the sky fading to night, we finished the leisurely hour-long trip around the lake and made it back to shore. The paddleboards, kayaks, and canoes were loaded up, and the paddlers all headed home. It was an amazingly good evening for a paddle, with nothing but some soggy grass to show for the rain earlier in the day. We’re looking forward to the next one on July 10th. If three dozen paddlers came out after a rainy day, I suppose reserving a boat or paddleboard early might be a good idea.